There are 365 species of squirrel. They can be found on every continent except Antartica and Australia. 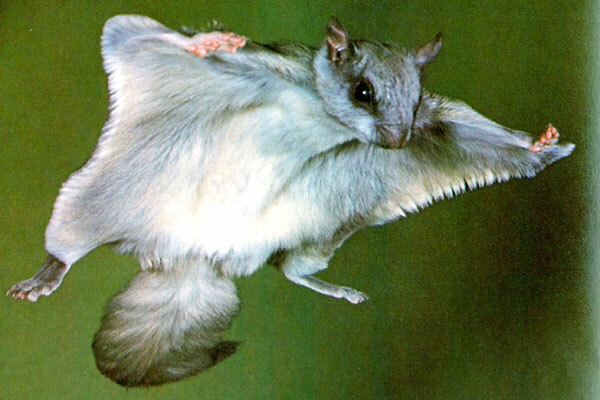 There are 50 species of flying squirrels. Eat nuts, fruit and seeds. Grey squirrels are called 'living fossils' as they haven't changed much in 37 million years. Have no colour vision - they see only in black and white. Their eyes are positioned so that they can see behind them. Millions of trees are accidentally planted by squirrels who have buried their nuts and forgotten where they hid them. They kiss to identify each other. Hind legs are double-jointed, which allows them to run up and down trees very quickly. Can climb trees faster than they can run on the ground. Use their tails both for balance and as a parachute. Can jumps a distance of up to 20 feet. Can run at speeds of up to 20 miles an hour. Will adopt other squirrel's babies if they are abandoned. In 2007, Iran claimed 14 squirrels found near the nation's border, were actually spies! Memorise their siblings by their sent. Flying squirrels glide between trees. Once they land, they climb back up a tree to continue their flight. Eat nuts and acorns, bark, sap, seeds, flowers, berries, fruit lichen, slugs, snails, young mice, insects, birds' eggs and baby birds. Main predators are raccoons, foxes, owls, coyotes, snakes, birds, cats and dogs. Live about 6 years in the wild and 10-15 years in captivity. Are members of the squirrel family. Live a feast or famine lifestyle - gorging themselves all summer to build up their fat reserves.